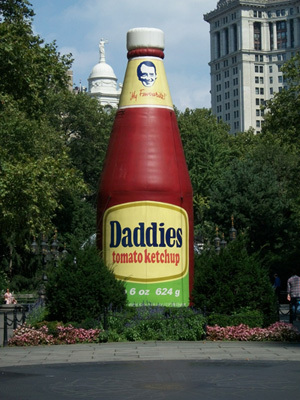 This 30 ft tall inflatable “Daddies Tomato Ketchup” is a public art installation at City Hall Park in lower Manhattan. The piece will be there till November 30th. The artist’s name is Paul McCarthy. Daddies Tomato Ketchup, now owned by Heinz, is a real brand in the U.K. It’s a fun installation though it’s difficult to not compare it with the pop art Andy Warhol did in the 60s.